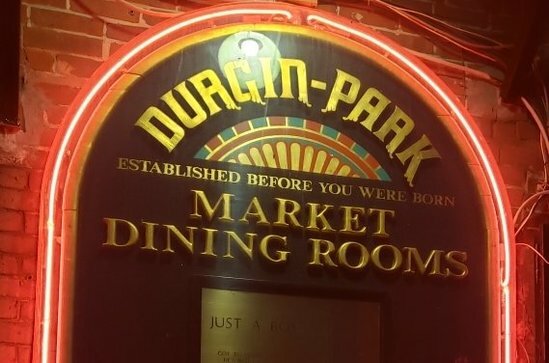 No Reserve PICKUP ONSITE ONLY auction of Advertising signs, memorabilia and other items from the recently closed, historic Durgin Park restaurant. Durgin Park Yankee Cooking banner 53" X 80"
Ralph Avery print of Faneiul Hall - Frame 25 1/2" X 20"
You've been outbid to S****b! to YOU! Faneiul Hall and other Boston photos -(1) 20" X 16" (4) 14" 11" and (4) 8" X 10"
Market Dining Brass Sign 22" X 82"
Retro "Please try our Franks and Beans" sign paint on chalkboard 24" X 18"
Sperm Sewing Machine and Bicycle Oil New Bedford framed ad - 17 1/2" X 14"
Serving Oysters on the Half Shell from the Cape sign paint chalkboard 24" X 18"